For nearly 100 years, Einstein Medical Center Philadelphia was home to the historic Strickland Columns, until building modifications forced them into storage. 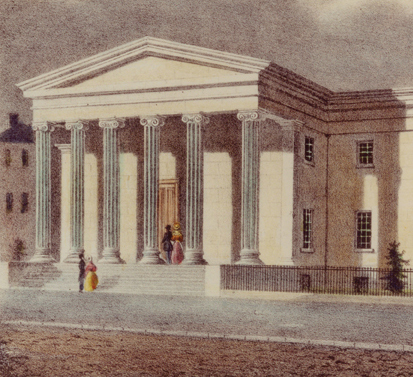 Originally, the columns graced the entrance of the second United States Mint at the corner of Chestnut and Juniper Streets in Philadelphia, dedicated in 1829. Designed by well-known Philadelphia architect William Strickland, the columns were modeled after the Temple of Ilyssus in Athens. The Mint was demolished in 1902. The fate of the famed columns was in doubt until architect Frank Furness and real estate broker Felix Isman collaborated to have the columns donated to what was then known as Jewish Hospital, now Einstein Medical Center Philadelphia. Erected flanking the hospital’s main entrance, they remained there until November 2000 when building modifications and traffic pattern changes required de-installation. For more than a decade the columns remained in storage. Then, The Auxiliary of Einstein Healthcare Network stepped in to help restore the columns to their original grandeur and place of honor on the grounds of the Delaware Valley’s largest independent academic medical center. Originally kick-started by funds obtained through a Pennsylvania History and Museum Grant administered by the Pennsylvania Historical and Museum Commission, the project to reinstate the columns was completed in April 2013 thanks to a generous grant from the Auxiliary. Landscaping and lighting to enhance the majestic qualities of the columns and the beauty of the Einstein Philadelphia campus will be completed this fall. Standing 24-feet tall and three-feet wide, the columns vary in weight anywhere from 10,400 pounds to 29,000 pounds. Now fortified with a strong foundation, the columns greet Einstein Philadelphia’s more than 10,000 daily visitors. Charlotte Rosenthal, a member of the Auxiliary for almost 30 years, is proud to see the columns back where they belong. For Einstein physicians and employees alike, the columns serve as a physical representation of the network’s commitment, not just to the city of Philadelphia, but to the region.